When I was a little girl my parents both worked in a factory. My mom would work days and my dad would work nights, so there was always someone at home, taking care of us kids. Our summers were spent in the country with our grandparents, helping out in the garden and going fishing. 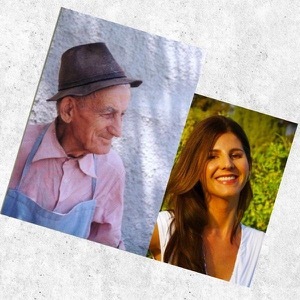 We never had much, most days we would snack on bruschetta and tomatoes, and when we got lucky at the river we would have a bucket full of sardines that my grandma would fry to a crisp perfection. Sunday was a different kind of day though. It was the only day off from work, and the family got together. There was a nice squab house on two stilts about 15 feet tall right next to the garden entrance. It had 8 cubbies on each side, like a little hotel for squab. I was always curious about the secret life of pigeons but was afraid to climb up the ladder more than half way. My grandpa did though, almost every Sunday morning and would bring down a baby squab that has never flown before, so that my grandma could make our Sunday stew, this rustic chicken stew and creamy polenta. 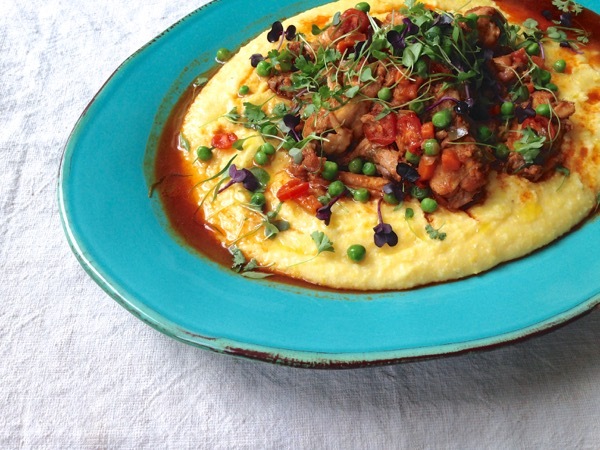 Nowadays I make this stew with organic free range chicken instead of squab, and serve it on creamy polenta. It is a peasant dish, but still one of my favorite meals ever, with a smell that takes me back to a place in time when things were simple and love was all that mattered. Heat up the olive oil in a heavy bottom cast iron pot. Add the onion and saute for 5 minutes or until translucent. Add the pepper flakes and bell pepper and saute for 5 more minutes, making sure not to burn the onion. Add the chicken to the pan , stir everything together with a wooden spoon and allow to cook for 5 minutes. Add the paprika and stir until the chicken is nicely coated. Pour in the chicken stock and bring to a simmer. Cover with a lid and allow to simmer for 15 minutes. Add the bay leaves and carrots and continue simmering on low heat for 45 min partially covered. Add the green peas and let them cook for about 5 minutes until heated through. Remove from heat, adjust seasonings and add the sliced tomatoes. Cover with the lid and let sit for 5 minutes for the tomatoes to release their juices in the stew. 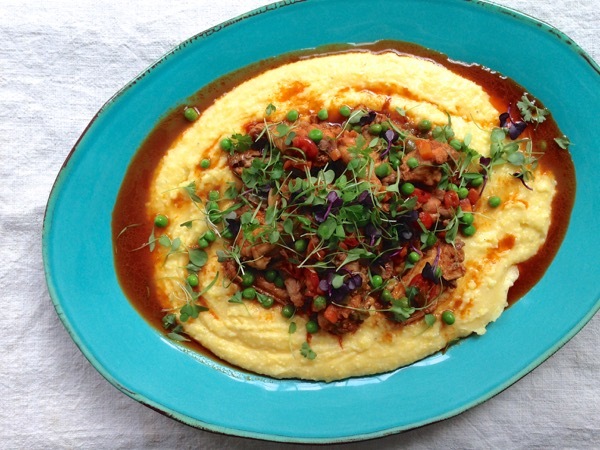 Serve over creamy polenta with a sprinkling of the fresh herbs/ micro greens and surrounded with the gravy. Meanwhile make the polenta by bringing the water to a boil, add the salt and bay leaf. Turn down the flame to low. Start pouring in the cornmeal in a steady stream while whisking constantly until everything is incorporated. Allow the polenta to simmer and switch to a wooden spoon. Stir every 15 minutes or so, until desired thickness is achieved (45 min -1 hour) Taste to make sure the grains are tender, remove from heat and stir in the cold butter, then the heavy cream and the parmigiano reggiano. 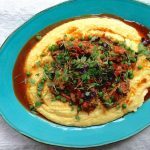 This looks so warm and comforting…plus I’m a total sucker for creamy polenta. my favorite food Creamy Chicken Casserole. Your Polenta (creamy) is my new favorite style. Thanks for the life-changing recipes.